Despite claiming double-digit economic growth largely based on its agriculture industry, the Ethiopian regime is now calling for international assistance to help feed 8.2 million of its citizens. Just a couple months ago, Western leaders and media outlets were fascinated with Ethiopia’s ‘miraculous’ economic growth. From Bill Gates to Obama, and everyone else in between, they were convinced and tried to persuade others that Ethiopia had put that sad history of famine behind itself and emerged as the fastest growing economy in Africa, if not the world. Fast forward to these past few weeks, reports have begun – giving back Ethiopia its old name – a starving country begging for urgent food aid. A month ago, the number of people needing aid were reported to be 4.5-million; now its 8.2-million and expected to reach 15-million by the end of this year. Two months ago, when OMN first reported about the death of children from hunger in Western Hararghe, the regime dismissed the reports and suppressed the plea for emergency food aid. It has now been forced to admit the crisis and it is, as usual, asking the world for food aid to feed its hungry population. No amount of PR campaign or cooking the numbers to showcase double-digit economic growth can hide the fact that Ethiopia is, once again, hit with famine. Let’s ask the obvious question: why is Ethiopia hungry again? Within the Ethiopian discourse, four factors are often attributed as causing the recurring famine. First, the government – not just the current, but also past regimes, usually blame the famine on the change in weather and climatic conditions for causing crop failures that result in food shortage. But how does an economy growing by double-digits, whose agricultural sector apparently shows at least 9% annual growth for over a decade and produced ‘millions of millionaire farmers,’ fail to produce enough surplus to feed few regions hit with shortage of rainfall? The second factor attributed to the problem of famine is not on shortage of food, but its weak circulation within the country. Popularized by Dr. Eleni Gerbremedihin, this argument states that a ‘market failure’ results in a situation where one region starves while another wastes food due to surplus production. So, Dr. Eleni took her “idea whose time has come” to the World Bank and Meles Zenawi resulting with the establishment of the Ethiopian Commodity Exchange (ECX) in 2008. Launched with a huge financial injection and a massive public relation campaign, the project promised to make famine history by ushering in a new system of market efficiency. As inspiring as Dr. Eleni was, few of us remained skeptical from the get-go. In response to her article promoting her project, I wrote a piece which argued that as long as the political market remains monopolized by one group, her ambition of creating an efficient and competitive exchange system is unlikely to be realized. I hate to say ‘I told you so,’ but 7 years later, ECX’s much anticipated revolution in agricultural market is not visible. Eleni herself has moved on (quit or fired depending on who you ask). And famine is back to being Ethiopia’s trademark. Genuine efforts to engineer market efficiency are either been rejected or sabotaged to serve the regime. If we take Dr. Eleni’s project, the regime twisted and turned it into a tool for further monopolizing the market. ECX enabled EFFORT-owned companies to push out competitors and monopolize the coffee export. A mechanism (ECX) – that meant to open up the market to increase efficiency – has turned out be a tool for control, corruption and monopolistic market practice. The third argument blames the famine on the land tenure policy of the country. 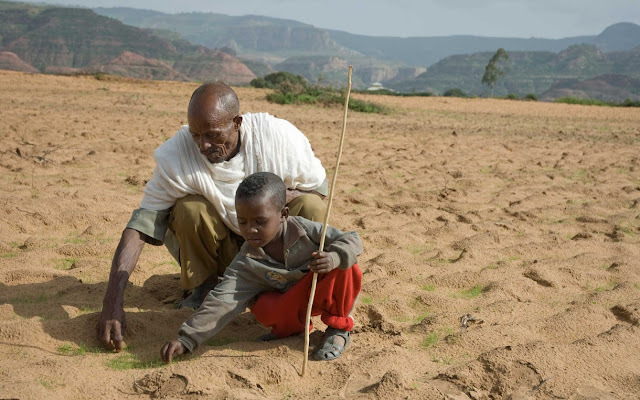 The argument goes that the source of food shortage in Ethiopia is farmers cultivating crop on small and fragmented plots of land using century-old subsistence farming practices. Highly publicized during the 2005 election as a key policy element of the Amhara opposition, this proposed solution advocates privatizing land ownership so that wealthy investors can help develop large plots of land using technologically advanced tools and inputs. This argument has already been put to test and failed to yield its intended results. Although land has not been officially privatized, domestic and foreign investors have been granted as much land as they request at dirt cheap prices. Yet, we are not witnessing the anticipated improvement in agricultural productivity, and famine remains a recurrent problem. Millions are starving even after over 3 million hectare of land has been leased out to the rich. Privatizing land while the political system is not competitive means, land would be transferred from millions of smallholders to few with connection to the ruling class. These few ‘investors’ are driven with profit maximizing incentives, hence mostly produce for export, or hoard their product to limit circulation with the market to keep price high. This leaves us with the fourth argument which asserts that lack of freedom is the real cause of famine. This idea was developed by India’s Amartya Sen, who used Ethiopia as a main example on a thesis that would net him the Nobel Prize. Basically, the argument affirms that famine occurs only in dictatorship not in democracy. In democracy, drought doesn’t necessarily lead to starvation as the media, civic society and elected officials preemptively publicize and exert pressure on the government to act early to ensure food supply. Let’s take Ethiopia and Kenya, for instance. Their shared border regions are inhabited by the same people who mostly live nomadic life, and the climate condition is the same. Whenever drought hits Southern Ethiopia, it also hits Northern Kenya. But famine in the Ethiopia-side of the border is a frequent phenomenon; Kenya rarely witnesses it. Hence, the lack of democracy is the only argument of the four which has not been tested and still stands as plausible in Ethiopia. As long as the country is governed by authoritarian regimes, drought projections are unlikely to be acted up on, leaving farmers to starve during the natural calamity whenever the climate changes. This current famine did not only bust the myth of Ethiopia’s economic miracle. It has also debunked the argument that the country could imitate the East Asian model of rapid economic growth while suppressing freedom. They can cook numbers, they could fool western diplomats and media outlets, but famine has come back once again to unravel the deception of the regime and illusion of its supporters. Poverty, and its worst form – hunger, will remain the hallmark of Ethiopia until the people attain freedom and establish a government that depends on their consent rather its own gun and external aid.